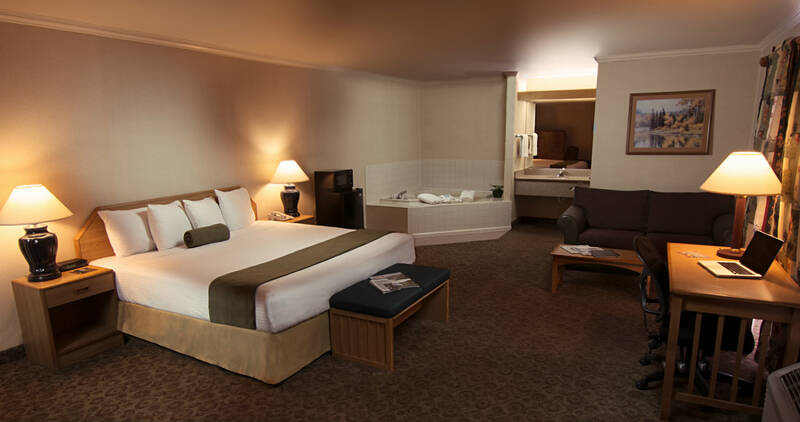 Our Redwood King Suites are perfect for romantic California getaways. An oversized room featuring a king-size bed with triple sheeting on all beds, this suite beckons you to relax and unwind after a day of exploring Humboldt County’s Redwood Coast. Take some time to soak in the deep Jacuzzi tub located in the corner of the room. The bathroom has a combination shower/tub as well as a granite vanity, where you can prep for a lovely dinner out at one of the many area restaurants. Other suite amenities include a 32″ flat-screen TV, a writing desk where you can catch up on your e-mail and the day’s events, a comfortable sitting area with a couch, a microwave and a refrigerator. After a peaceful night’s sleep, you’ll be treated to a complimentary full, hot breakfast at the Canteen, which features local jams, honey, and seasonal fruit.